New outdoor wheels were the first thing to sort (any excuse to shop!) and we bulk ordered matching green ones – team colours and all that. Then training began in earnest. We headed down the Embankment whenever the weather was nice and skated up and down the riverside path, putting in mile after mile and developing blisters on top of blisters. The skating experience was very different to the smooth sports hall derby track (there were stones, twigs, dogs, and goose poo!) but I soon got used to it and started to enjoy a bit of alfresco skating. ‘This isn’t going to be too bad’ I thought to myself as I skated past people enjoying an afternoon walk and eating ice cream in the sunshine. However, when lining up at the start line on a very wet and windy Sunday afternoon in Preston I began to think that maybe I’d underestimated what I’d agreed to do. I also thought that my friends were probably right and that I was completely mad. It certainly wasn’t the warm sunny spring afternoon I’d hoped for, plus I’d got a stinking cold and, thanks to a very short notice work trip, I’d had to get up at 3am that morning to fly back from Poland to make the race. At that moment in time, skating 26.2 miles in torrential rain was the last thing I wanted to do, but I didn’t have time to worry about it for long as the starter horn honked and we were off. We decided to work as a team to help each other – we’re Nottingham Roller Girls and Gringos, it’s what we do – so we formed a ‘skater train’. The front skater set the pace and sheltered everyone behind them from the wind. After a lap (we were skating round a mile-long sports track) the leader would drop to the back of the line and the next skater would take over. We took it in turns; mile after mile; our skates getting more waterlogged with every passing lap – whispers of ‘trench foot’ could be heard in the air. But every time we passed through the start line we were cheered on by the NRG guys who had already completed the half-marathon. 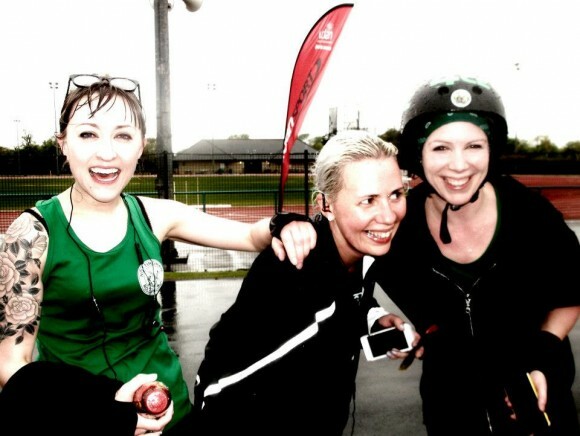 They were stood in the pouring rain to support us, and they certainly kept me going. As the miles rolled by the track seemed to get longer and the little hump-back bridge that had seemed so small at the start began to develop Mount Everest style qualities. Some of the NRG girls tackled it by ‘roaring’ and screaming up the hill. I discovered that apparently I don’t roar, but rather I squeak and giggle. As I crossed the finish line 2hours 40mins after we’d started my GPS said I’d skated 26.5 miles but Gem Aargh’s, who I’d skated the whole race with, only said 25.6 miles, so we somehow found the energy to skate another lap, just in case, just to be on the safe side – at the very worst we could call it a victory lap, and certainly to me completing the marathon was a victory. Our marathon efforts have so far raised £1558.56 for Inspire Nottingham. This entry was posted in Events, Experiences by FeartrixRotter. Bookmark the permalink.